This new foundation from Laura Mercier is the perfect blend of coverage. blendability and comfort. It is a high performance foundation that is sweat, heat humidity, water and transfer resisitant for up to 15 hours. Coated pigments glide on to create buildable medium to full color that beautifully evens out skin tone and minimizes the look of pores and imperfections. Because coverage is buildable, it starts off with a medium coverage and can be built up to a full coverage if needed. It has a weightless texture that looks, fits and feels like a second skin. Skin-fusion technology provides the ultimate long-wear with breathable ease. The skin-fusion technology has a high-tech liquid thin mesh that seals the formula into place. It ensures that the pigments stay in place all day yet feel comfortable and weightless. Color stays true all day and won't oxidize. It controls oil immediately and throughout the day. It has a matte finish that is never dull, flat or cakey. The weightless texture looks fitsand feels like a second skin. 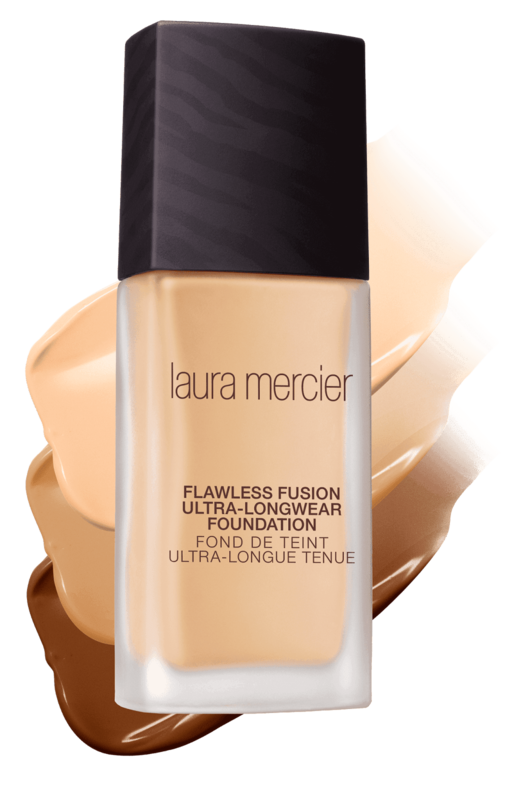 In a 4 week trial with 32 women, 100% agreed that Laura Mercier's Flawless Fusion Ultra-Longwear Foundation "feels weightless". This foundation comes in 20 shades that range from the palest to the darkest. It covers many skin tones, cool, neutral and warm. I tried Shell and it worked pretty well for me but Creme would have worked okay too I think. The best way to use the foundation is to dispense a small amount onto the back of your hand and apply to face with Laura’s Egg-Shaped Sponge or fingertips. For best results, use after your preferred Laura Mercier Foundation Primer. It is very important to use primer before the foundation to get the best results from the foundation. You can use a brush for medium coverage and a sponge for heavier coverage. For the most flawless, natural look, Laura says it's key to avoid over-applying foundation to the middle of the face, where too much formula can accentuate lines and other imperfections. With liquid, crème, or powder, she recommends starting at the outer portion of the face and working inward towards the nose. Focus on one area at a time and be sure to blend well. Avoid excess application around eyes or the contours of the face. Repeat application until desired coverage is achieved. Remember, use foundation to even out your skin tone. Use concealer to camouflage imperfections. So far this is by far my favorite foundation that I have ever worn from Laura Mercier. It has buildable coverage that is invisible, it goes on easily and does not show up. It is resistant to sweat, water and humidity: for me a godsend at this time. And it wears all day long. It wears like iron. I love it. The colors are great too. Shell looks good on me, just a tad too pink. I am sure I could have worn Creme too. 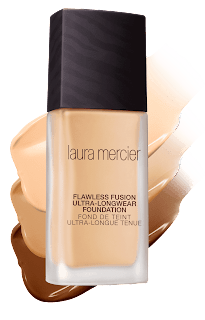 I love Laura Mercier foundations, they really are some of the best in the business and I think this one is likely one of her best yet.